The following links allow you to access data sheets, manuals and other documentation for products we no longer sell. Products are listed in chronological order. Programming backdoor: use EDC Ultimate manual and change 10 clicks to 250 clicks. 85P, 120P and variants (120E, 120T, 120M, Storm, Wichita, SpecialOps, Classic, SPL-120) were licensed to NovaTac for manufacture and sale in 2006. Model variations are essentially differences in factory presets, battery configuration and location of manufacture. 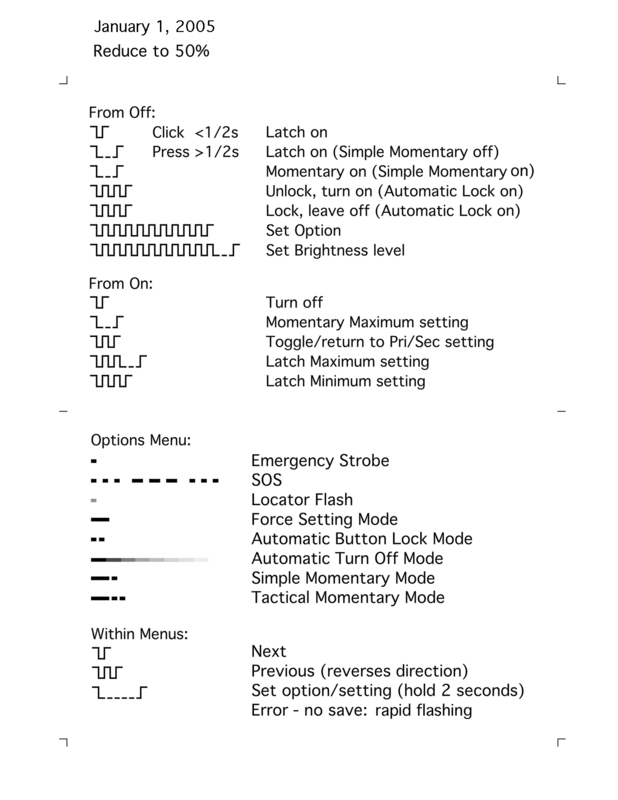 Programming backdoor for non-P models: use P manual and change 3 clicks to 250 clicks to enter option menu and enable menus. These lights are very similar to the EDC Ultimate with the following significant changes: 1) constant current controller - NOT constant power, 2) menus can be enabled and disabled, 3) the brightness menu self-scrolls, 4) much shorter runtimes on the low settings and 5) large flats on either side of the head for markings. The EDC Classic was marketed under both HDS Systems and Ra Lights and sold from 2007 to 2008. The EDC Classic had a maximum output of 120 lumens. The EDC Classic resembled a slightly longer NovaTac 120P with a number of reliability improvements. The EDC Classic was the first of our flashlights to implement a fullly floating battery compartment with limiters to prevent battery damage during hard abuse and prevent power resets during gun recoil.